Think about it. They call it the greatest story ever told. Actually it’s the greatest healthcare ad campaign that ever ran. It’s text book marketing. Firstly, you have a blockbuster product that can solve all ills. Then you have 12 KOLs ready to advocate. You have patient stories inside that make the whole thing come alive. You have ten important guidelines for prescribing. You even have jingles that everyone knows. You have salesmen (and now women) who go in to the community and spread the word. And you have the promise of ever-lasting life. And no medics to say you can’t say that. All you need is three wise men and some cattle. Now that’s a case history. Your Conference stand isn’t an Advert. It’s easy to see the conference stand as an extension of your Ad campaign. In terms of marketing and image it might seem indivisible because you have to get them on the stand so you need loud messages to get their attention. That’s how an ad works right? Well, if you say so, but your stand isn’t an ad. Think of all your favourite retail brands, those stylish department stores, or the fashion boutiques that entice you in with elegant window designs or places like the Apple store that just exude cool. Do you enter them because of the big messages in the window? No, the retail seduction is a much more subtle dance. People are are attracted to simplicity, cleanliness, boldness and yes – even creativity. This is a place I could hang out for a while you think. On a stand the dynamic is the same. Delegates step in to the client’s world for a few moments, attracted by the sparkly things and interesting gizmos. And yet when it comes to a conference we are often asked by clients to put as much messaging and logos as we can to fit the space. Hang the aesthetics, give me branding. And that’s okay if you want to be as visible as one of those discount sportwear warehouses. When Steve Jobs decided to launch the apple shops everyone told him he was mad. No device manufacturer had ever sold directly to the public, devices were sold via tech shops like Dixons or dept stores like John Lewis. But Jobs knew that the shops would perform more than one function. Yes, a way to sell more phones and laptops without that third party bias towards their own products, but a shop was also to create a huge presence on the high street, a loud statement of brand and a way to interact with people on a human level via the genius bar. The response should be: wow I want to go in there, not: look there’s that phone shop. Remind you of anything in Pharmaland? 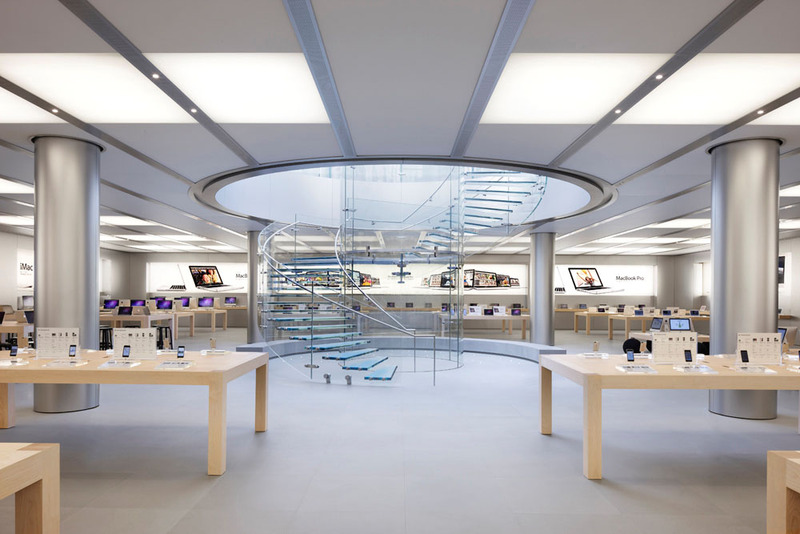 And Jobs was meticulous over every detail, sourcing the glass windows from all corners of the earth, making sure the steps flowed in just the right way through the store, making the whole shop an experience. The shopping experience as a concept, not just a retail outlet. I sometimes wonder, when the world’s most successful company does something globally successful why everyone else doesn’t just watch, learn and well – copy. And yet still we stick with what we know, thinking more is more. Perhaps it’s time for us all to think different.